Lady Goodgirl is a beautiful slim line motor boat with a narrow, rounded stern and bow that cuts through the sea. 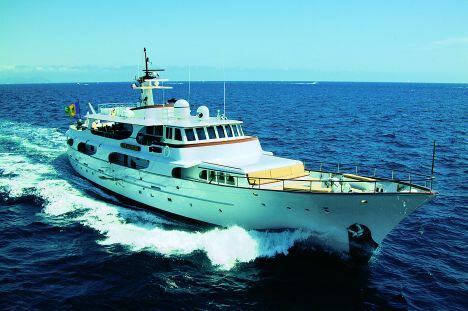 The boat, with its steel hull, measuring 42.9m in length and 8m beam, was built in 1964 at the Hall Russell shipyard and restored in 1999 and 2004. It has a cruising speed of 12 knots and charters in the Croatian sea in the summer and the Caribbean in the winter (St. Marteen base). The present captain is Chris Felstead, the fleet is Cavendish White. 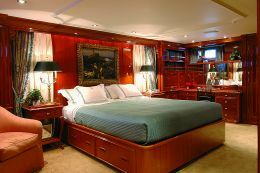 The interior design of the boat is about as beautiful, warm and romantic as one can imagine for a dream holiday: it is not just a cruise across the sea but one into the past, as it conjures up a relaxing and exclusive atmosphere from former times. 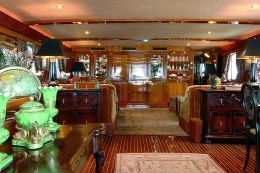 It can only be a pleasure for charter guests, especially after a day of blinding sun and sea, to head inside the Lady Goodgirl and find oneself in an area covered in wood, with valuable furnishings, rugs and delicate colours as well as beautiful old paintings depicting sea life. This maximum comfort is rounded off with good food and wine, enjoyable reading and the only concession to modern day life, a small TV set. The boat can be accessed through the stern bridge, fitted with wooden table and chairs for eating in the shade during the day and dining by candle light in the evening. Entering the lounge we are immediately struck by the two side walls with vast windows draped with heavy dark curtains and broken up by small, delightful marine paintings, the flooring done in planks of dark wood with rugs in subtle colours, beautiful furniture and a mellow, relaxing atmosphere. To the left of the entrance is the dining area with an oval shaped table and high backed wicker chairs, to the right a folding table that serves as a consol to a valuable set of oriental porcelain. Two low sideboards in dark, decorative wood, separate the dining area from the living area that has two symmetrical corner sofas, one at port and one at starboard side, covered in a champagne coloured velvet with spotty cushions. Pouffe, table with magazine holders, two large coloured globes and four large table lamps with dark external lampshades, complete the furnishings. The fore living area bulkhead is closed in by a beautiful wooden piece of furniture with glass part, a part closed in by a door to hide the TV, and finally an arched part that houses the bar. The subtle lighting comes from brass spotlights with opal glass on the ceiling and table lamps. The paintings are highlighted using special spotlights. 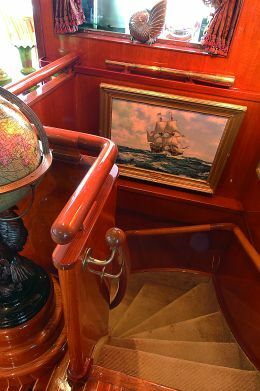 The beautiful wooden stairway that leads down to the sleeping quarters is decorated with maritime paintings and in the area between the cabins is a large, unusual painting with a close up view of a storm at sea: almost only waves coming on board a boat. The guests have three double cabins and two twin ones, each with en suite bathroom. The owner's cabin is worth mentioning. Here again there are vast windows draped with heavy cream coloured curtains. The style is vaguely colonial, all the walls, bed and furniture are in white polished wood with square motifs cut out from horizontal and vertical pilasters. The finishing touches are in gold. Even the bed linen is white with a gold trimming. The bed cover has floral motifs with coloured shoots, flowers and leaves. Above the bed, instead of a headboard, is a valuable painting depicting a river port with turreted building and boats with white sails. A wide vanity completes the wall to port side. Sleeping in this cabin during navigation must arouse fairytale emotions. In the bathroom, the walls, sunken bath and sink unit and drawers are finished in the same way as the cabin; only the sink's built-in surface and the upper edge of the bath tub are in dark wood. The brass taps are worth a mention with zoomorphic motifs (possibly dragons heads), practically impossible to find. The Chinese lacquered wall piece is of some value. 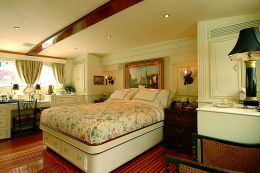 One of the other suites is also unusual, all done in dark wood with cream coloured ceiling and carpet. Once again the headboard for the bed is a beautiful painting representing a stormy sea with shipwrecked survivors and a yacht adrift in the background. In this cabin, the more modern bathroom is done in dark wood and light marble. 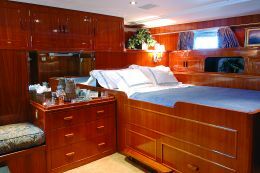 The twin cabins, all in wood are very "marine", linear and comfortable, decorated with paintings. There are so many paintings on board Lady Goodgirl that we could almost define this boat as an "art" or "masterpiece charter". There is a crew of 8, including the captain. All the bedrooms have LCD or plasma TVs. There is satellite TV throughout the boat. For sea activities, the boat is equipped with water skis, wakeboards, like surfboards to be used for water skiing, banana and donut rides, fishing and snorkelling equipment and canoes with see-through bottom. There are also two tenders: a 4.80m Zodiac with 40 CV out board engine and the other, a 7.5m with 200 CV out board.